Bahrain airport is also a major cargo hub in that general area with several international carriers like Lufthansa, British Airways, Martinair, and DAS operating through it. Bahrain airport is also the designated super-hub for DHL. 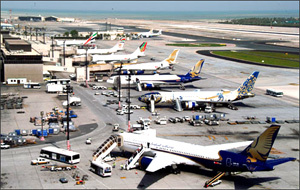 More than three million tons of cargo passes through Bahrain airport per year. The terminals at Bahrain airport were recently modified to include a First Class and Business Class check-in lounge for premium travelers that offer discrete check-in and immigration facilities with a direct access to departures. Recently, a new one thousand square meter First and Business class lounge was also opened for Gulf Air. In 2005, the Bahrain airport also opened two more lounges for Cathay Pacific and the Dilmun Lounge for other airlines operating through Bahrain Airport. The Arrivals Immigration procedures have also undergone several changes in order to make sure that individuals as well as groups can be passed through the various checks quickly with a minimal amount of time spent. People who take Bahrain flights can also enjoy the duty free shopping offered through the award winning shopping mall in the Departures Lounge. The future plans of Bahrain Airport include a US$ 350m expansion in order to provide eight more air bridges and more aircraft parking space. This is aimed at increasing the Bahrain airport capacity to 15 million passengers per year until 2015 and additional plan for increasing this to 22 million passengers by 2020. The check-in disks will be doubled and more shopping facilities will also be built. Other plans include the building of a new multi-level car parking to increase the parking spaces and also offer offices and retails outlets that will be directly linked to the main terminal building. This parking space is expected to cost about US$ 70 million.